Mental P Mama has done a very fun meme, but she doesn't seem to be in a tagging mood. Which I'm sure is fine with most of you, but me? I feel loved when I'm tagged. And I liked this one enough to STEAL it. Yes. I stole it. Do you know, I wanted to write "I stoled it". Those lol kowz are taking over. Stink. Speaking of which, I'm proving myself a liar and throwing in an lol kowz photo at the end of this post. Be warned! ANYWAY, the point of this meme is to write your memoir in six words. Six. I thought, "Oh! This should be fun!" But that's only five words. Honestly, I say that all the time, so it might as well be my memoir. But I decided to step back and take this a little more seriously. First, I dug out the workbook from the writer's conference I attended a couple of years ago and found the working definition for memoir. A memoir is not about me, but about the situation or issue that's a common thread in my life. The subject is the THING - the thing of significance IN my life. Oh geez. Maybe I don't want to do this meme after all. So then I had to find the issue which winds its way like a black ribbon through my life, alternately choking and shaping me. Ew. Who wants to go THERE? But, in the interest of following through I've started, namely this post, I'm goin' in. There are a couple of threads which are visible under the black light of introspection (betcha didn't know introspection was a black light, huh? Try it sometime wearing white - you'll see). Once upon a time I would have said that loss and rejection were the largest, darkest ribbons, choking the life out of me, of my relationships, sucking all the air out of my lungs. It's not true of me anymore, thank God. Yes, God has a lot to do with it. So what, now, is the ribbon?! Stink. Time to dive in again. "I cherish as I am cherished." Is that cheesy or what? That's my six word memoir. I realized one day, with other people's help (I'm a huge advocate for living in community and connecting on different levels with different people), that I am cherished. On many levels. My memoir reflects that. It reflects that I cherish as often and as much as I remember that, feel it, live in it. It also reflects that I am adopted, and that that alone speaks volumes. Yes, I'm tagging three people. People whose memoirs I'm interested in reading. All six words. First is Mayberry Magpie. She waxes philosophical quite well. Second is Zobabe at Next Day's News. Her life story to date is fascinating and I'd LOVE to hear what her take away is. And third is Katie at Overflowing Brain. Not JUST because she lives in New Orleans, but because she's young and enchanting and I need a fresh perspective on someone else's life right now. As promised, the lol kowz. You still have time to click away! I kid. That just popped in my mind when I saw yours because I'm a goof off. Oh my. I am going to be thinking up six word things like that all day now. I am totally going to steal this meme after I do the other memes I was actually tagged for. Of course, knowing me, I'll do this one first, because I LIKE it. But you never know. I love Fred n Bessie. What a cute couple. Are they married? Hey, have you read The Shack? I am about 3/4 through it and wondered what your theology-studyin' self would think about it. OH. So you give ME the HARD one, huh?? Weyell, then. I'll be back. LOL! Those horny kowz!! Here's my 6. I mess up everything I touch!! That's a great meme! Who thinks of these things anyway???? I drink wine all the time. Sigh. 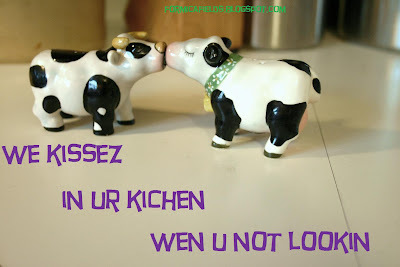 Those cows ... so romantic. For creatures made of ceramic, they sure do know how to put some passion into it! Your memoir is brilliant! I'm quite peeved I didn't think of it myself. By the way, you should have stolen the idea from me. I've already done it. Only I couldn't get it done as succinctly as yours, so I pasted two six-word memoirs into one 12-word memoir. See the post on March 17. P.S. Coffee bean: yours rock, too! I'm not sure if F&B are married. Honestly, they don't tell me anything. I second Magpie's endorsement of Coffee Bean's memoirs! REMEMBER ME WITH A SMILE. OK? Yours is so not cheesy. I found it lovely. I think that's a fantastic memoir-- and what a great way to be thought of long after... well, you know. I would tag you really, if I could just be creative enough to come up with a meme.